This guest blog post was written by Brian Crawford, co-chair of Bike Walk Oak Park, an advocacy group that works to improve biking and walking in the near west suburb of Oak Park. The views expressed here by Bike Walk Oak Park are their own and do not necessarily reflect the views of the Active Transportation Alliance. 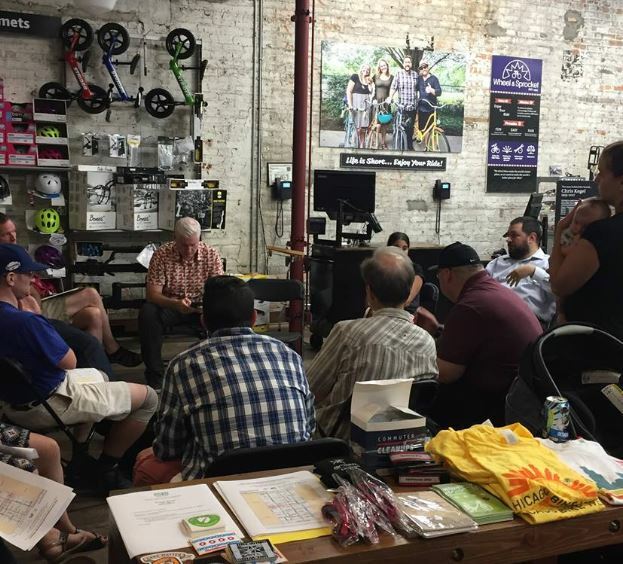 With the April 2 municipal elections presenting Oak Park voters with 11 candidates for three village trustee vacancies, Bike Walk Oak Park (BWOP) took advantage of the opportunity to query the candidates on pedestrian/bicycle issues and present the results to voters. This is an important election for Oak Parkers concerned about these issues. The board is losing two of its more supportive trustees who chose not to seek re-election. With only a narrow margin of support for biking and walking issues reflected on the board at present, just one more non-supportive voice could further stall efforts to implement Oak Park’s 2015 Neighborhood Greenways Plan for another two years. Bike Walk Oak Park’s candidate survey was designed to serve two main purposes. First, it helped candidates become more aware of the subject matter in greater detail than they otherwise might. For many otherwise earnest public servants, they too often think about easy things like more bike racks as the ultimate goal. To be fair, there are many compelling issues competing for space in the candidates’ minds. Second, for whoever wins the election, it plants BWOP’s stake in the ground before any new trustees even take office, and it serves a springboard for BWOP’s advocacy platform for the next two years when the next election cycle begins. A recent Bike Walk Oak Park meeting. Photo courtesy of Bike Walk Oak Park. Two specific questions we wanted to lay out for our candidates was whether they support the 2015 Neighborhood Greenways Plan for Oak Park, a comprehensive plan that has been doing little more than gathering dust since it was approved almost four years ago by a previous board, and to measure support for a “fair-share” line item of up to $200,000 per year in the village capital budget to be used for the Greenways Plan and other transportation safety projects. With 11 candidates vying for only three open seats, it is unlikely that any one candidate will gain a true mandate from voters. The loudest voices often take up most of the oxygen in campaigns like this one. That’s probably the case in most small-town elections. And that also means it is an election where only a few votes can make a difference. To develop our survey, we started with the Active Transportation Now’s excellent survey of Chicago mayoral candidates. We localized it and condensed it to five questions, plus one open-ended question to give each candidate a chance to tell the community in their own words where they stand on our issues. The Bike Walk Oak Park Strategy Committee evaluated the responses of the eleven candidates. After a lengthy and spirited discussion, we ranked them on a four-point scale: Supportive, Mostly Supportive, Neutral and Not Supportive. A pleasant surprise was that most candidates were at the upper end of the scale. Two of the candidates seemed neutral or indifferent and only one was clearly not supportive of focusing on biking and walking priorities. Rather than editorialize about the responses, we let the candidates’ words speak for themselves by posting their responses verbatim on the Bike Walk Oak Park Facebook group in shareable posts that encourage comment and sharing by individuals. There has been a considerable amount of discussion and our Oak Park voters seem pleased to have this insight into the candidates’ thinking. The process has not been without challenges. We were able to get responses from each of the candidates, but about half of the candidates were late in responding and we were barely able to meet our deadline of getting responses out before early voting began on March 18. We didn’t anticipate how busy the candidates were with surveys from different parts of the community; we’ll allow more time during the next cycle. We’ll also consider revising our ranking scale and possibly even endorse candidates in the future. We elected not to make endorsements this time. Bike Walk Oak Park is emerging as a strong voice in Oak Park transportation policy-making. We intend to continue to activate our constituents as our new village board is elected and seated. Our candidate survey has already paved the way to good relationships with these important elected officials. You can see our survey tool and the way we presented candidate responses at www.facebook.com/bikewalkoakpark.